We've been so into Wii fit around here lately. 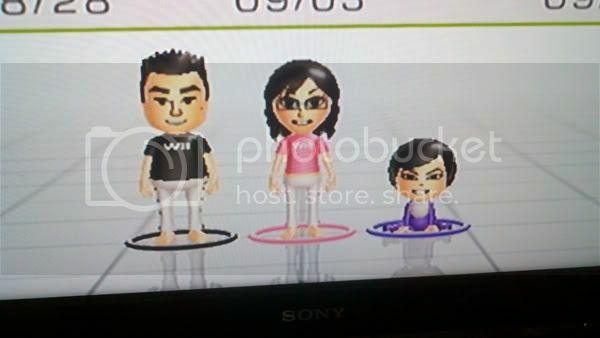 We even made a mii for miniboss. 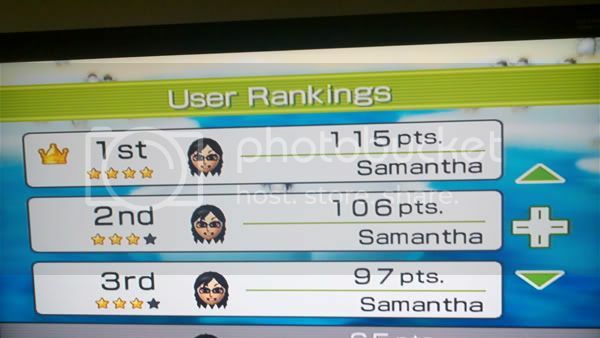 Tom and I are so competitive at beating eachothers scores. At first I pretty much sucked at every game n had the body of a 41 year old lol. Saddd I know. No balance and no coordination skills what so ever. I hated the wii. But now I have over 12 hours invested in the Wii fit and I am so proud of myself. I got a perfect score on beginners soccer! I couldn't even hit 5 balls before! And not to mention it works! I feel my core getting a lot stronger and being a full time mommy and barely having free time to myself, this is pretty awesome. The miniboss will actually sit on the couch, watch me play, and cheer for me after every game I play lol! I get to play games, get toned, and have my own personal cheerleader? What's not to love? check out some of my scores! 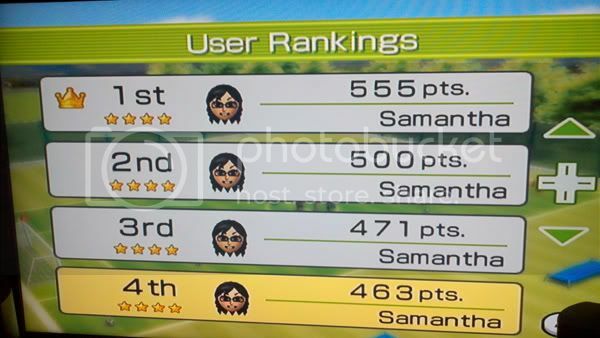 I also rock at hula hoop, and ski jump, which I have a top score in. Tom beat me at skateboard, juggling, balance bubble, and snowball fight. Which I am trying to beat his scores..everytime I do I text him a pic of my winning score while hes at work lol. I'm looking forward to getting just dance 3 that's coming out in October. I can't dance at all, but miniboss does so I feel the need to not let her down and be an embarrassing non talented mom so hopefully I can learn some dance moves on that game and me and her can dance together lol.